A crepe maker is an affordable and easy way to diversify your menu, by using the same products and ingredients you have in your kitchen! 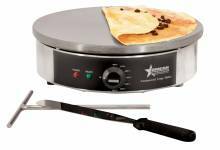 Whether for home or commercial use, a crepe maker allows you to offer an easy product that is held in high esteem! Making crepes has never been easier!